So I promised that I would write about the people we meet on our travels, and now that we have been on the road for slightly over 100 days (yay!) I feel that we have met a good collection of different types of people, so I am going to write a little mini-series. Jan and Trevor - they left London in their kitted out Landrover for a gap year, driving through Europe, to Turkey and round the Med into the Middle East. We met them in Uganda where they were heading to Rwanda to finally arrive in South Africa at the end of the year. Trevor is a twitcher, so Stuart got on famously with him, as Jan and I were busy sharing movies and audiobooks from their terabyte drives. Entertainment is important on a long journey like this. Poomba, aka Mandy and Jacques, had been on the road for 14 months when we met them at Fat Monkeys on Lake Malawi. They were heading back home to South Africa from Australia, having shipped the car to Novosibirsk to cross Asia and Europe. 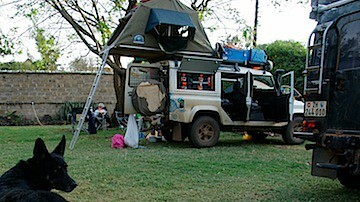 Their Land Cruiser was home made, and after such a long trip everything most definitely had its place. The first big truck we encountered made quite an impression on us. Two German guys had dissolved their company to pay for a brand new truck to be fitted out so that they could go on a World tour. 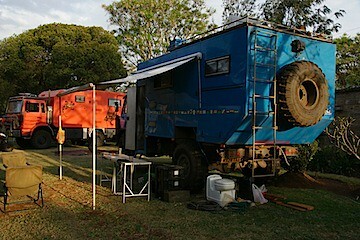 When we met them in Lusaka they had already spent a year dawdling their way down from Europe, planned to spend another year in Southern Africa before shipping the monster truck to South America and carrying on. They were so self sufficient, they looked like they may never return to stationery life. PS: It was my birthday for a whole weekend!